Four years ago the Algarve Oncology Association (AOA) gave a presentation to the Estoi Palace International Rotary Club and an idea was born to help them with the purchase of a much needed new mobile breast screening unit with state of the art technology. The original vision changed slightly along the way, as the AOA applied for European funding to supply the state of the art equipment, including tomosynthesis which improves detection rates, and also to fund a research project as breast cancer in the Algarve. The world average of breast cancer per 100.000 is 55.14 women, the European average is 73.8 women and in the Southern Algarve a staggering 91.6 women, so the need for high tech detecting equipment was critical. This plaque is attached to the mobile screening unit and lists those organisations who co-operated to make this great achievement possible. We thank them. 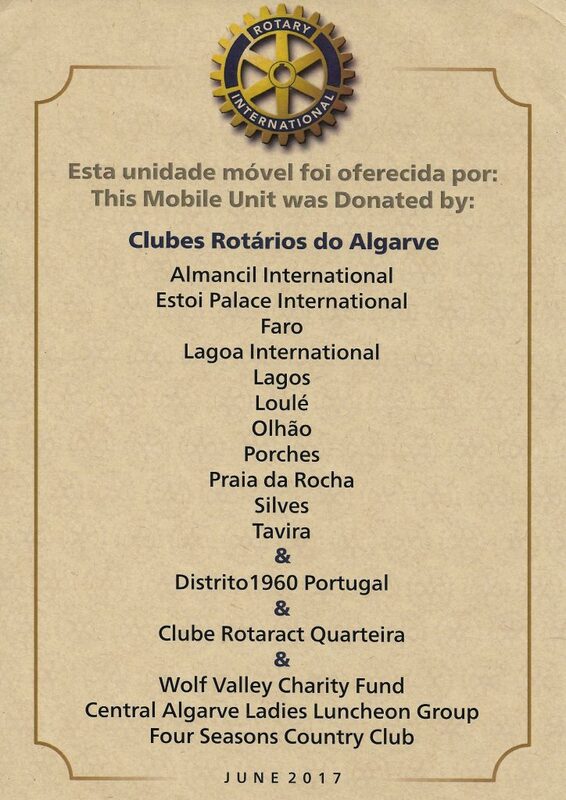 Enlisting the help of other Algarve Rotary Clubs, the Wolf Valley Charity, and the Central Algarve Ladies Luncheon Group, fund raising events were organized and donations given to enable the purchase of the mobile unit which carries the equipment. The mobile unit arrived in the Algarve at the end of May and became operational in early June. A cheque in the sum of 63.037 euros was handed over to the President of the AOA Maria de Lurdes Marques da Silva e Sousa Santos Pereira by 1960 Rotary District Governor Abilio Lopes, on Tuesday 27th of June, at Albufeira Health Centre, where the unit is currently located. At a reception held afterwards at Casa do Cerro Restaurant in Albuferia, Maria de Lurdes spoke movingly about her late husband the former AOA President, Dr. Jose Santos Pereira, whose recent death meant he did not see his dream of the new mobile unit come to fruition. Dr. Santos Pereira had fought all his life for better treatment for cancer patients, recognizing that early detection was crucial. His vision brought about the first mobile breast screening unit in the Algarve 15 years ago and the Faro Radiotherapy Unit. His dream lives on with this new, state of the art mobile breast screening unit. For further information on Rotary Clubs in the Algarve or any of the associations involved please contact shirley.d@rotaryestoipalace.org.